The perfect gift for those in your life who just love tea! Buy as a gift or as a wonderful treat for yourself. With Christmas just around the corner this is a fantastic way to gift something a little different. Any tea drinker would be thrilled to receive this set, and it is a sure way to make their Christmas even better. 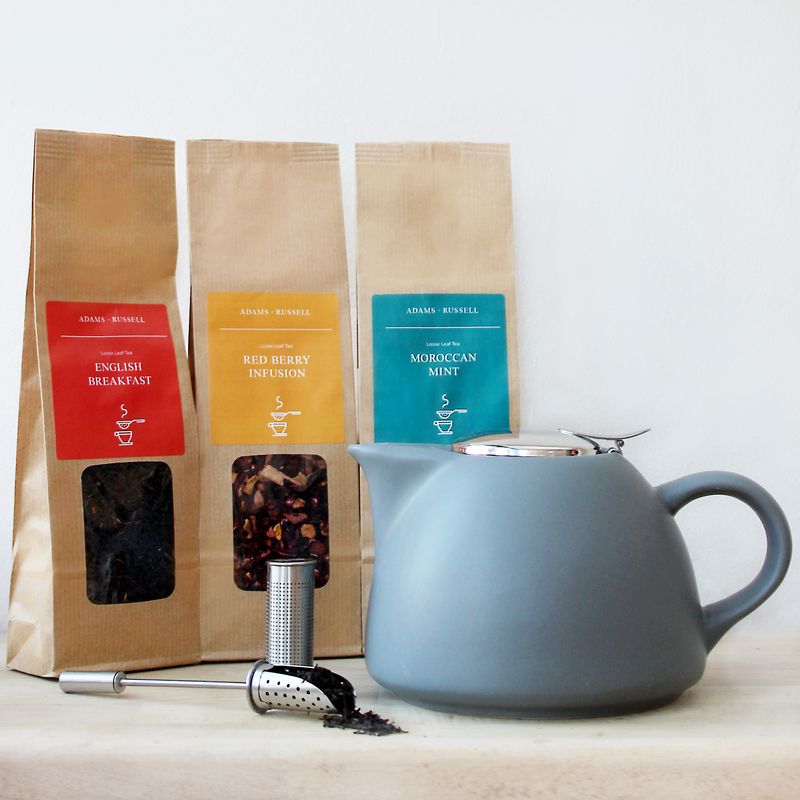 This set is great value for money as it includes three bags of our premium loose leaf tea, one La Cafetiere Barcelona teapot and one tea swizzle infuser. Differing from other gift sets on the market, we have given our customers the option to choose which tea’s go into the gift set, making it completely customisable. This makes your Christmas shopping even easier as you can tailor it to all your recipients tastes and preferences! Morrocan Mint – A robust blend of refreshing spearmint and gunpowder tea. Gunpowder Green – A green tea with a light smoky and nutty character. Lemon & Ginger – This is an infusion rather than a true tea, it is great for when you are feeling slightly under the weather. Earl Grey – Fragrant, spicy, citrus flavour. A blend of Keemun, Ceylon, and Assam, scented with the delicate aroma of the Bergamot fruit. Assam – A black tea that has a distinctive malty flavour. English Breakfast – Malty, light and refreshing, blended from Assam, Ceylon, and Darjeeling. Camomile – This fragrant, delicate, floral infusion is great for relaxing and your health. Redbush Rooiboos – Sweet, rich, orange and light clover characters, all the way from South Africa. Ceylon – Pungent and flowery character with a strong taste. Jasmine – Subtly sweet with added jasmine flowers. This is a green tea. Peppermint Leaf – A peppermint herbal leaf that is naturally caffeine free. Mixed Berries Infusion – Flavours of Hibiscus, Rosehip, Apple Pieces and Orange Peels. Bright with a beautiful bouquet and superb fruity flavour. Darjeeling – Floral and fruity character with a light spice. Decaf English breakfast – Classic Breakfast Tea without the caffeine. Lapsang – A traditional Chinese tea with light tartness and subtle smoky characters. Is your secret Santa more of a coffee lover? Well no problem, we’ve got you covered! We have a detailed guide of brilliant gifts for coffee lovers that is sure to give you some inspiration. Have a read here.